Packing for Fashion Week is always SUCH a struggle. (Yes, I know this is a seriously cliche fashion blogger statement, but just bear with me). This season, I knew I had to have some sort of strategy so as to not go totally insane during the process. To make matters worse, I just moved into our new house this summer and my clothes are EVERYWHERE; downstairs closets, upstairs closets, the attic, my car and yes, even at Catherine’s house. It’s always tempting to pack all of your ‘HEY LOOK AT ME’ pieces when heading to New York so as to capture the eyes (lenses) of the Street Style photogs and in our instance, yes, Cath and I would like to think of ourselves as the next Caroline Vreeland and Shea Marie. However, this time, we decided to take a more minimalist approach and pack our favorite basics – tees, jeans – and have our accessories make the outfits pop. I’ve already talked about this amazing Chanel Bag and Catherine shared her Louis Vuitton, but we also had on hand a few pairs of great shoes, an array of sunglasses and other things like bandanas, watches, etc.. to choose from. Luckily for us, as a duo, we can share and hopefully *seamlessly* share our pieces. I’ve got to say that it worked out pretty well this time, but who knows what will happen when frigid February rolls around for next season’s shows. MY LOOK: Tee, Free People. Denim, TopShop. Boots, Zara (similar one, two). Sunnies, Le Spec. Bandana. Chanel Boy Bag. 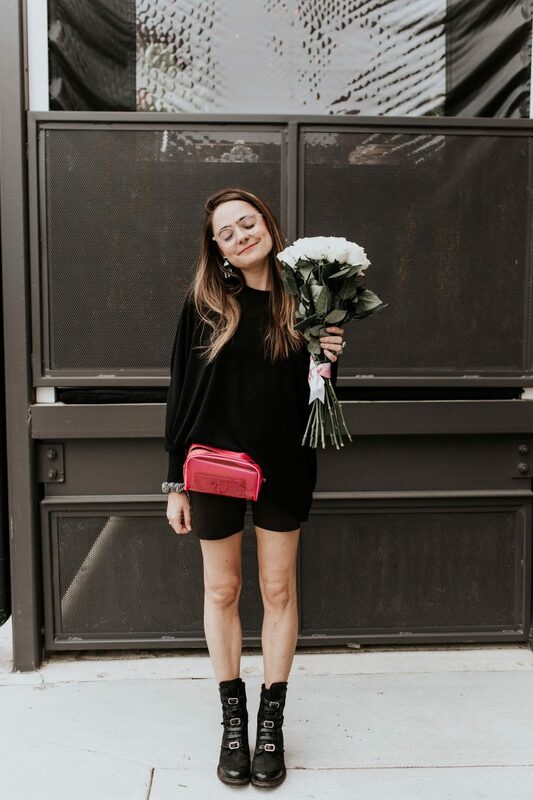 We always love visiting the Shopstyle Social House during Fashion Week, and can thank the wonderful Ugla Hauks for snapping these pix of us there!